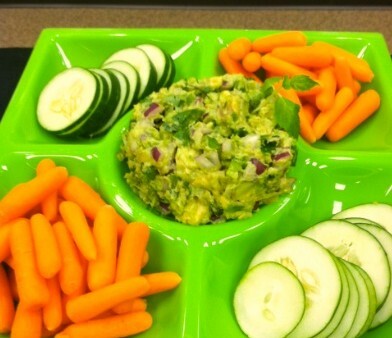 Serve fresh vegetables like baby carrots, cucumbers, peppers and tomatoes with homemade guacamole. Combine all ingredients with spoon for a chunky texture or in a food processor for a more smooth texture. Serve with fresh vegetables like carrots or cucumbers. Recipe by Dr. Keith Kantor, a leading nutritionist and the CEO of Service Foods, Inc., who is an advocate of natural food and healthy living. He is also the author of What Matters: Leadership Values That Just Might Save America.